Woodgrain laminate doors and top are complemented by a neutral charcoal gray frame. Elevated top features premium bright metal hardware for a contemporary, spacious look. Tackboard for hanging notes, memos and more. Sorting bins for easy access to documents and files. An ideal combination of practical storage and high-tech style. Woodgrain laminate doors and top are complemented by a neutral charcoal gray frame. Elevated top features premium bright metal hardware for a contemporary, spacious look. 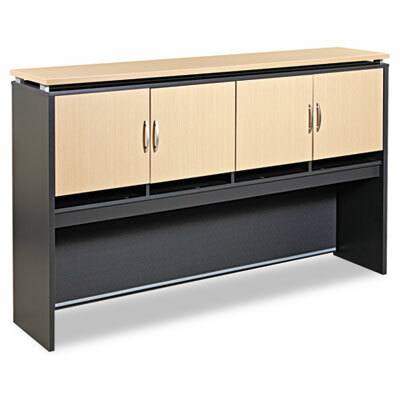 Provides enclosed storage along with a handy tackboard for hanging notes, memos and more. Sorting bins for easy access to documents and files.